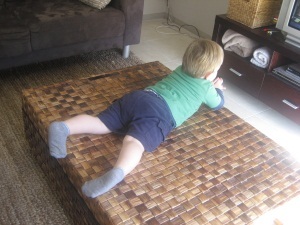 Not so long ago, Hugo realised that he could climb onto the coffee table. Initially, he was just laying on it with his chest, which followed by him trying to lift a knee onto it in a climbing action. Claire & I jumped on that behaviour as soon as he started it, however it hasn’t stopped it completely and Hugo will test the water again every so often. While Claire & I were at the other end of the house recently, we returned to the kitchen to see Hugo laying or more precisely, lounging on top of the coffee table watching one of his favourite TV shows. Hugo doesn’t watch a great deal of TV, however there are a few shows that he absolutely adores. I’m not sure what it is about any one given show at a time that captures his attention, but he clearly goes through phrases.